NVTA acquired Accessor Parcel Numbers (APNs) 057-250-025 and 057-250-036 for the purpose of constructing a new transit maintenance facility to replace the currently leased site at 720 Jackson St. in Napa. The property consists of approximately 351,964 square feet of undeveloped land. The approximately eight-acre project site is located on two parcels at the terminus of Sheehy Court, approximately 900 feet west of its intersection with Devlin Road, in unincorporated Napa County, California. • Compliance with all building and design standards and regulations including American with Disabilities Act (ADA). The property is located within the Napa Valley Gateway Business Park, a 300-acre business park located adjacent to the Napa County Airport on Highway 29 in South Napa County which accommodates a combination of industrial, warehouse and service retail. In accordance with the California Environmental Quality Act (CEQA) and the CEQA Guidelines, NVTA has prepared an Environmental Impact Report (EIR). As part of the EIR, issues that were found to have potentially significant impacts in the Initial Study and therefore required additional analysis in the EIR included air quality, biological resources, GHG emissions, hydrology and water quality, land use and planning, noise, and transportation/traffic. The public and all affected agencies were invited to review the Draft EIR and submit written comments. The forty-five (45) day comment period was from September 19, 2017 to November 2, 2017. The Final EIR can be reviewed and accessed at:www.nvta.ca.gov/vine-transit-maintenance-facility or at NVTA offices during regular business hours. PUBLIC HEARING: A public hearing for the recommended certification of the EIR and approval of the project is scheduled to be heard at the NVTA Board of Director’s meeting on January 17, 2018 at 1:30pm or thereafter in the City Hall Council Chambers 955 School Street Napa, CA, 94559. Please check the Board Agenda at http://www.nvta.ca.gov in case of changes to the scheduled hearing date. All persons interested in the matter may appear and be heard at this meeting. The review period for comments pertaining to the Draft EIR extends from September 19, to 5:00 P.M. on November 2, 2017. Project Location: The approximately eight-acre project site is located on two parcels (Napa County Accessor Parcel Numbers 057-250-025 and 057-250-036) at the terminus of Sheehy Court, approximately 900 feet west of its intersection with Devlin Road, in unincorporated Napa County, California. The property is located within the Napa Valley Gateway Business Park, a 300-acre business park located adjacent to the Napa County Airport on Highway 29 in South Napa County which accommodates a combination of industrial, warehouse and service retail. The proposed project would replace an existing deficient maintenance yard that is leased from the City of Napa. The present facility located at 720 Jackson Street in Napa is insufficient for Vine Transit’s existing service and cannot accommodate future growth because it does not have enough bus maintenance bays or parking or sufficient space for a modern bus wash. It further cannot accommodate visitor or employee parking. Purpose of this Notice of Availability: The NVTA circulated an Initial Study-Mitigated Negative Declaration in October of 2016 to analyze this same project in compliance with the California Environmental Quality Act (CEQA). Subsequent to NVTA’s adoption of the Initial Study-Mitigated Negative Declaration in 2016, NVTA decided to prepare an Initial Study and an Environmental Impact Report (EIR) to further evaluate the project’s environmental impacts. The purpose of this Notice of Availability (NOA) is to inform agencies and interested parties and persons that NVTA has prepared a Draft EIR for the proposed Vine Transit Bus Maintenance Facility Project in accordance with CEQA Guidelines, Section 15087. This NOA provides information about the project and its environmental effects and requests that comments be provided on the content of the Draft EIR. The Draft EIR is also available for review at the Napa County Public Library, located at 580 Coombs Street, Napa, California, 94559.
Review Period: The review period for comments pertaining to the Draft EIR extends from September 19, to 5:00 P.M. on November 2, 2017. Potential Environmental Impacts: An Initial Study was prepared for the proposed project and found that the proposed project would have no impacts or less than significant impacts (either with or without mitigation) for all resource areas evaluated under CEQA, except for air quality, biological resources, greenhouse gas emissions, hydrology and water quality, land use and planning, noise, and transportation and traffic. These seven resource areas were evaluated in the Draft EIR. The project was found to have a significant and unavoidable cumulative impact on biological resources, less than significant impacts on hydrology and water quality and noise with the implementation of mitigation, and less than significant impacts on air quality, greenhouse gas emissions, and transportation and traffic. The project was found to have no impact on land use and planning. Providing Comments and Comment Period: NVTA is soliciting comments on the Draft EIR. Comments provided will be considered in the Final EIR in accordance with CEQA Guidelines, Section 15088. Due to the time limits mandated by State law, your response must be sent at the earliest possible date and not later than 45 days after receipt of this NOA. The review period for comments pertaining to the Draft EIR extends from September 19, to 5:00 P.M. on November 2, 2017. Please send all comments by either: 1) U.S. mail; or 2) electronic mail (email). If submitting by email, please send to info@nvta.ca.gov. Please note that all comments become part of the public record. Contact Rebecca Schenck if you have any questions about the environmental review process at the contact information provided at the beginning of this NOA. City of Napa Water Map- Sheehy Ct.
Napa Sanitation District Recycled Water Map- Sheehy Ct. The conceptual site plan is reproduced at the end of this notice. The proposed project would replace an existing deficient maintenance yard that is leased from the City of Napa. The present facility located at 720 Jackson Street in Napa is insufficient for Vine Transit’s existing service and cannot accommodate future growth because it does not have enough bus maintenance bays or parking or sufficient space for a modern bus wash. It further cannot accommodate visitor or employee parking. The purpose of this Notice of Preparation: NVTA circulated an Initial Study-Mitigated Negative Declaration in October 2016 to analyze this same project in compliance with the California Environmental Quality Act (CEQA). Subsequent to the adoption of the Initial Study-Mitigated Negative Declaration in 2016, NVTA decided to prepare an Initial Study and an environmental impact report (EIR) to further evaluate areas of known public controversy. Therefore, in accordance with the State CEQA Guidelines (14 California Code of Regulations [CCR] Section 15082), NVTA has prepared this notice of preparation (NOP) to inform agencies and interested parties that an EIR will be prepared for the above referenced project. The purpose of an NOP is to provide sufficient information about the proposed project and its potential environmental impacts to allow agencies and interested parties the opportunity to provide a meaningful response related to the scope and content of the EIR, including mitigation measures that should be considered and alternatives that should be addressed (State CEQA Guidelines 14 CCR Section 15082[b]). The Initial Study may be viewed online at http://www.nvta.ca.gov/vine-maintenance-yard or at NVTA offices, 625 Burnell Street, Napa, California during regular business hours. Review and Comment Period: NVTA is requesting comments from your agency on the scope and content of the project’s environmental information that is germane to your agency's statutory responsibilities. If your agency will be issuing a permit in connection with the proposed project, your agency will need to use the EIR prepared by NVTA when considering your permit or other project approval. 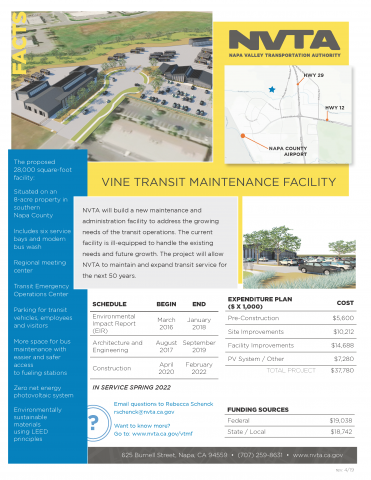 To view the Final Vine Transit Bus Maintenance Facility MND Report, click here. To view the Vine Transit Bus Maintenance Facility, click here. To view the Vine Transit Bus Maintenance Facility Appendicies, click here. In December 2013, consultants Kimley Horn completed the Bus Maintenance Yard and Fueling Facility Report. 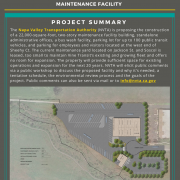 The report documents the feasibility of the proposed Facility for the Napa Valley Transportation Authority (NVTA). The feasibility study was prepared to plan the required space for a new bus maintenance facility, identify potential property sites in Napa County, screen the sites based on prioritized criteria, prepare conceptual facility layouts for the top ranked sites, and finally recommend a preferred site for acquisition by the NVTA. To read the feasibility report, click here, or download the document on your right.